ATTRACTIVE VERY LARGE ANTIQUE VICTORIAN CARVED WHITE CARRERA MARBLE CHURCH ALTAR. A BEAUTIFUL VICTORIAN CARVED CARRERA MARBLE ALTAR REMOVED FROM AN ABERDEENSHIRE CHURCH. WE DATE THIS ALTAR TO THE SECOND HALF OF THE 19th CENTURY. THE ALTAR SITS ON A BREAKFRONT PLAIN PLINTH BASE. THE ALTAR BASE SECTION HAS STEPPED BACK SIDES. THE FRONT SECTION HAS THREE RECESSED PANELS. THE TWO SIDE RECESSED SECTIONS HAVE ARCHED TOPS. THE LARGE CENTRAL SECTION HAS A SHALLOW ARCH TOP AND HAS A CENTRAL IHS RELIEF CARVING WITH THE WORDS 'ALTARE PRIVILEGIATUM' ENGRAVED UNDERNEATH WHICH IS LATIN FOR PRIVILEGED ALTAR. THE TWO STEPPED BACK SIDE SECTIONS HAVE RECESSED PANELS CONSISTING OF A LARGE ARCHED SECTION BELOW TWO SMALL ARCHED SECTIONS. THE TOP SECTION CONSISTS OF A TABERNACLE WHICH PROTRUDES BEYOND THE SIDE SECTIONS AT THE FRONT AND TOP. THE TABERNACLE DOOR SITS BEHIND A PLINTH WHICH SUPPORTS TWO TURNED MARBLE COLUMNS, WITH DARK GREEN MARBLE CENTRE SECTIONS, SITTING UNDER AN ANGULAR ARCH. THE TOP OF THE TABERNACLE HAS A DARK GREY SLATE ROOF. THE TWO SIDE SECTIONS HAVE INTEGRAL CORNICES AND HAVE RECESSED PANELS WHICH SIT BEHIND FIVE TURNED MARBLE COLUMNS, MATCHING THE TABERNACLE COLUMNS, SITTING ON A PLINTH BASE. THE COLUMNS SUPPORT THE BASE OF ATTRACTIVE GOTHIC ARCHES. THE TABERNACLE DOOR IS CONSTRUCTED FROM HEAVY EMBOSSED BRASS AND IS DECORATED WITH VERY ATTRACTIVE ENAMEL DETAIL IN RED BLUE AND GOLD. THE DOOR IS FITTED WITH A CENTRAL LOCK(KEY SUPPLIED). THE INTERIOR CAN BE HIDDEN BEHIND A WHITE CURTAIN. 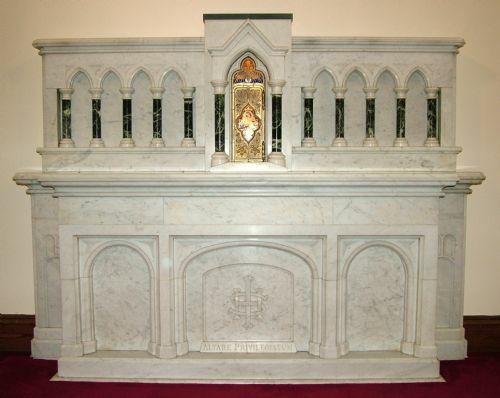 THE ALTAR HAS THE RELIC EMBEDDED IN THE MARBLE IN FRONT OF THE TABERNACLE. THE HEIGHT OF THE ALTAR IS 78", IT HAS AN OVERALL WIDTH OF 113" AND AN OVERALL DEPTH OF 35". THE ALTAR IS IN A GOOD OVERALL SOLID CONDITION. THERE ARE A FEW USAGE MARKS AND TINY CHIPS TO SOME EDGES. DURING DISMANTLING ONE OF THE ARCH RAILS HAS HAD AN UNFORTUNATE BREAK BUT WAS VERY CLEAN. MOST OF THE DARKER PILLARS HAVE A SMALL AMOUNT OF DAMAGE, SOME AT SOME POINT IN THE PAST AS THERE WAS A SMALL BOTTLE WITHIN THE CONSTRUCTION OF THE ALTAR STATING THE NAMES OF THE PEOPLE WHO REASSEMBLED IS DURING THE 20th CENTURY. FURTHER PICTURES OF THESE FAULTS ARE AVAILABLE ON REQUEST. Attractive large antique carved walnut combination wardrobe. A lovely large antique carved walnut combination wardrobe. We date this wardrobe to the early 20th century. The wardrobe comes in three section, the hanging top section, the lower drawer section and separate cornice. The front of the wardrobe is of a three panel design. The doors are fitted with shapely brass drop loop handles mounted on a very decorative brass back plates. The handles turn to operate the catches and the doors are fitted with working locks (key supplied). The wardrobe sits on five small turned legs arranged three at the front and two at the rear. The interior of the top right hand double section is fitted with brass side to side hanging rails with five double coat hooks. The left hand single section is fitted with a shelf above two linen press drawers with further double hooks to the top. The base section houses three short over four long drawers. The drawers are fitted with very decorative cast brass drop handles mounted on shapely brass back plates similar to the door handles. The wardrobe has a height of 84" (214cm) with a width of 75.5" (192cm) and a depth of 20.5" (52cm). This lovely very large carved walnut combination wardrobe remains in very good solid condition with only very minor surface markings commensurate with age and usage. There is a little bit of wear around the edges at the base and to the outer sides. The hanging section has had fittings for shelves added at some point in the past, we have left these in should a new owner wish to add shelves at some point in the future. This remains a very stylish and elegant large combination wardrobe which will continue to provide sterling service for many years to come. Attractive low antique Victorian figured mahogany double wardrobe. A beautiful low Victorian figured mahogany double wardrobe. We date this wardrobe to the second half of the 19th century. The wardrobe comes in four sections, the hanging and drawer sections, the base and the cornice. The cornice is of a stepped design and the wardrobe sits on a plain plinth base. The cornice has ornate rounded front corners above carved corbels. The front of the wardrobe is of two panel design with each panel being a large side hinged door. The door fronts have central recessed panels with arch tops. The right hand door is fitted with a working lock and catch (key supplied). The left hand door is secured with side mounted top and bottom lever bolts. The interior of the right hand section is fitted with a bank of six solid drawers. The left hand side has a later added side to side hanging rail. The original hooks and material have been removed at some point in the past. The wardrobe has a height of 74.5" (189cm) with a cornice width of 64" (163cm) a base width of 56" (142cm), a cornice depth of 29" (74cm) and a base depth of 25" (64cm). 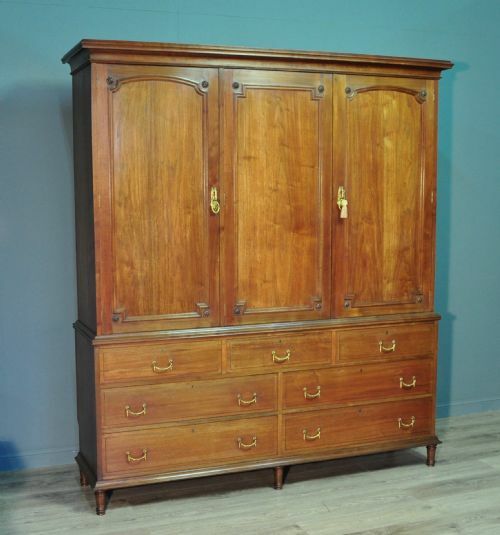 This lovely large Victorian figured mahogany wardrobe remains in very good solid condition with only very minor surface markings commensurate with age and usage. There are some minor wear marks and indentations, primarily to some of the edges. There are a few minor veneer chips top the top of the left hand door and there are a couple of old repairs to the rear bottom edges. This remains a very stylish and elegant Victorian mahogany double wardrobe, which will continue to provide sterling service for many years to come. Attractive large antique oak wind out/drop flap extending dining table. Lovely antique oak wind out extending dining table. We date this table to the early 20th century. The end of the table has a 'Thompsons Patent' plaque. The table sits on four sturdy well turned legs with reeded decoration. They sit above later added furniture gliders. The main table consists of two large panels with canted outer edges. The table is fitted with a winding mechanism (winder supplied) which parts the main leaves and allows the extension leaves to be inserted. The two leaves are able to be stored under the table edge when not in use. The table has a distinct drop flap design when fully closed. When fully closed the table has a height of 29.5" (75cm), a length of 47" (120cm) and a width of 24" (61cm). With just the flaps up, the table has a height of 29.5" (75cm), an unextended length of 47" (120cm) and a width of 42" (107cm). With the extension leaves in place the length increases to 71" (180cm). 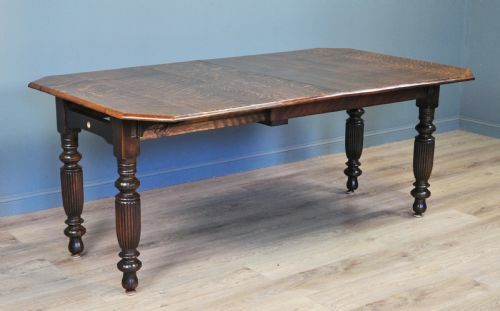 This lovely large oak dining table remains in very good solid condition with only very minor surface markings commensurate with age and usage. There are some indentations and light marks to the table surface from past use including a slightly darker mark to the table top. This remains a very stylish and elegant dining table which will seat 4-6 in comfort unextended 6-8 with the extension leaves in place. It will continue to provide sterling service for many years to come. Attractive antique Edwardian mahogany music filing cabinet. A lovely antique mahogany music filing cabinet. We date this cabinet to the early 20th century. The front of the cabinet is very ornate and has a double door cupboard over a filing area which in turn sits over a wide drawer. The top surface has an ornate swan neck pediment to the rear. The doors have decorative handles and the right hand door is fitted with a lock (key supplied). The interior of the top cabinet has three removable very ornate shelves. The gallery, drawer and doors have attractive inlaid banding. The cabinet has an overall height of 52" (132cm), a main top surface height of 46.5" (118cm), a width of 25.5" (65cm) and a depth of 16" (41cm). 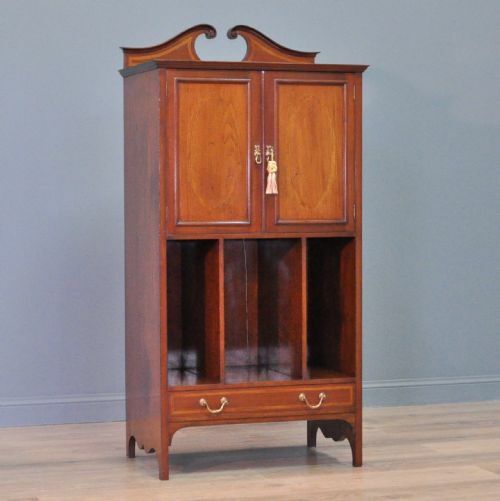 This lovely mahogany cabinet remains in a good solid condition with only very minor surface markings commensurate with age and usage, including some minor surface markings and indentations to the top surface finish. There is an old repair to the front left hand side corner. 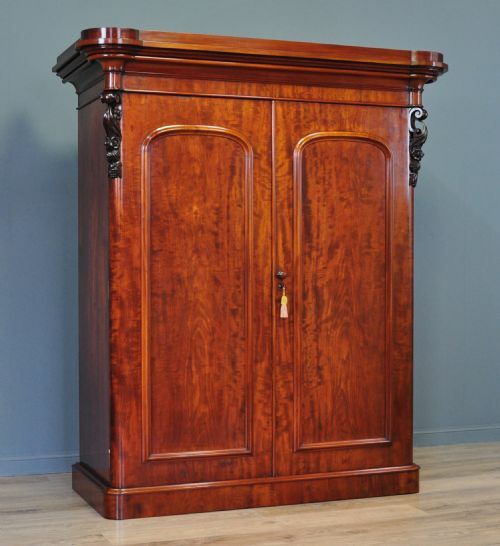 This remains a very stylish and elegant mahogany cabinet which will continue to provide good service for many years to come. Attractive vintage oak court cupboard. A lovely vintage court cupboard. We date this court cupboard to the first half of the 20th century. The cupboard sits on four turned legs. These are braced with stretchers. 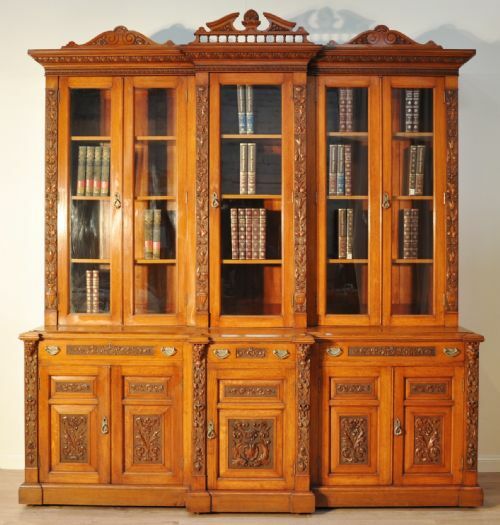 The main bottom cabinet consists of a large single door cupboard, the door has an attractive carved design. The top section has a pair of cupboards with carved linenfold decoration on the doors. Each cupboard door is fitted with a lock (no key is supplied but a suitable replacement should be easily obtainable). The cupboard has an overall height of 66.5" (168cm), a main table height of 39" (99cm), a width of 51"(130cm) and a depth of 21.5" (55cm). 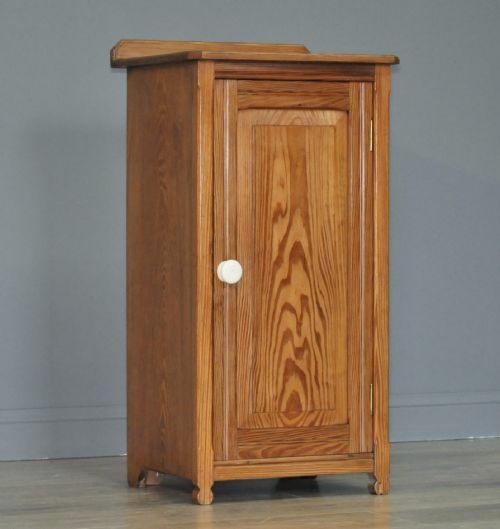 This lovely vintage oak cupboard remains in very good solid condition with only very minor surface markings commensurate with age and usage, including some minor indentations and marks to the top surface from past use. The handles turn to operate the catches, only the top right handle is operable but the doors stay firmly shut. This remains a very stylish and elegant oak cupboard. It will continue to provide good service for many years to come. Attractive antique Edwardian mahogany sofa settee. An attractive Edwardian settee. We date this settee to the very early 20th century. The sofa sits on three cabriole legs and a single square section one to the rear. The seat base has been well padded and sprung. At present the sofa is upholstered in a light cream heavy woven patterned material. The material is in a good usable condition but has a few minor usage marks and light areas of wear, please note that we have not attempted to have the settee professionally cleaned. The dark mahogany frame has been very ornately carved. The sofa has an overall height of 32.5" (85cm), with an overall width of 72" (183cm) and an overall depth of 30" (76cm). It has a backrest height of 19" (48cm), a seat height of 14" (36cm), a seat width of 44" (112cm) and a seat depth of 21" (53cm). This attractive Edwardian mahogany sofa remains in a good solid condition. One of the lower pieces of webbing has split and a spring is showing against the undercloth. 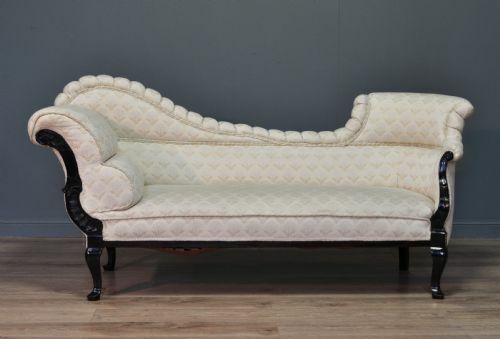 This remains a very stylish and elegant Edwardian mahogany settee. It is very comfortable and supportive to sit on and will continue to provide rest and relaxation for many years to come. Attractive large antique Victorian mahogany sideboard cabinet. A lovely Victorian mahogany sideboard. We date this sideboard to the second half of the 19th century. There is evidence to the rear of the sideboard that suggests there has been a gallery of some form attached in the past, this has been removed at some point in the past. The sideboard comes as a single section so please be aware regarding access etc. The sideboard sits on a plain plinth base and has an inverted breakfront design. The sideboard comprises of a central cupboard below a large drawer flanked by two outer cupboards which in turn sit below a smaller drawer to each side. The left hand cupboard is fitted with a small drawer at the top, it has been lined in green baize. There is a bottle drawer to the base and a mid mounted shelf. The central cupboard has a mid mounted shelf and the drawer is opened by pulling on the recessed grooves underneath. The right hand cupboard has a mid mounted removable shelf. The right hand and central doors are fitted with locks (keys supplied). The outer left hand cupboard is missing its lock, the door stays firmly shut when closed. The sideboard has a height of 38" (96cm), a width of 73" (186cm) and a depth of 21.5" (54cm). This lovely large Victorian sideboard remains in a good solid condition. The top surface has a few minor indents, marks and light scratches from past use. There is a bit of wear to some of the veneers including a few small chips and some replaced veneers around the base. This remains a very stylish and elegant large Victorian mahogany sideboard which will continue to provide good service for many years to come. 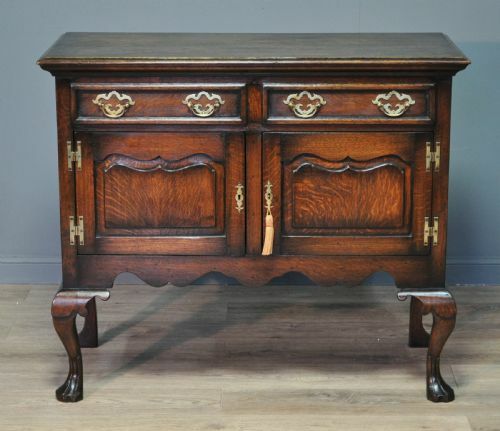 Attractive antique Victorian mahogany washstand. 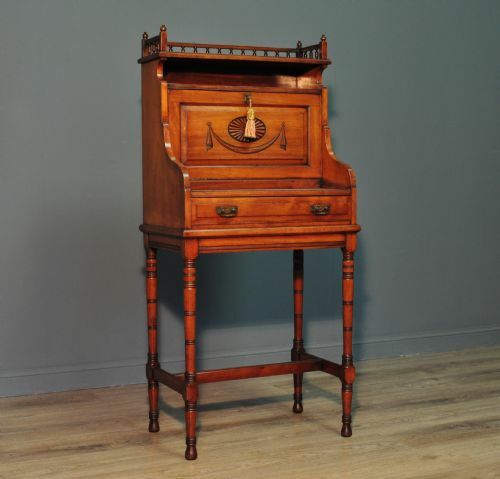 A lovely Victorian mahogany washstand. We date this washstand to the second half of the 19th century. The washstand sits on four small downward tapered legs. The main table is fitted with a lift up lid. This lid has folding shelves to the rear and the main surface has fold out panels. There would have originally been a drop well where a basin would have sat in the centre, this hole has been filled at some point in the past. The main cabinet is fitted with a large cupboard below two drawers. The doors, drawers and lid are all fitted with locks (keys supplied). The drawers and doors have further inlaid banding just inside the panel edge. When closed up the washstand has an overall height of 36.5" (93cm), a width of 49" (125cm) and a depth of 23.5" (60cm). This attractive Victorian mahogany washstand remains in very good solid condition with surface markings commensurate with age and usage. The top surface has a couple of slightly heavier indented lines and there are some minor veneer chips. The surfaces under the lid have a number of ring marks from past use and there are a couple of minor age splits to the centres of the doors. The drawers appear to have had their handles removed at some point. This remains a very stylish & elegant Victorian mahogany washstand, it will continue to provide sterling service for many years to come. Attractive vintage school pommel horse and crash mat. 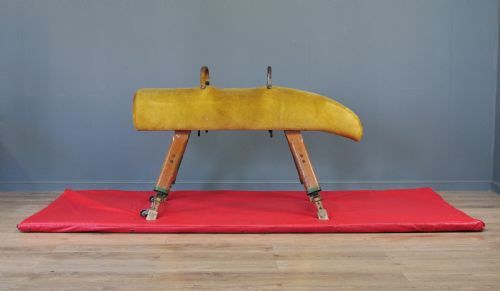 A lovely vintage large pommel horse and crash mat. We date this horse to the second half of the 20th century. The horse sits on extendable legs and has two bars to the top. The horse has a height of 42" (107cm) with a width of 65" (165cm) and a depth of 14" (36cm) at the body. This lovely vintage pommel horse remains in very good solid condition with only very minor surface markings commensurate with age and usage. There is an amount of shoolboy graffiti including an unfortunate swear word as shown in the pictures. This remains a very stylish pommel horse. It will continue to provide good service for many years to come. Attractive antique Edwardian Arts & Crafts carved walnut desk. A lovely antique Edwardian walnut desk. We date this desk to the early 20th century. The desk consists of a drop front writing section over a drawer. The desk sits on turned legs with an H stretcher for support. The top surface has a decorative gallery which features small turned finials. The front flap features attractive carving and is fitted with a decorative brass lockplate. It is fitted with a lock (key supplied). The drop front lowers to provide the writing surface and is fitted with numerous pigeon holes and small drawers. The desk has a height of 49" (125cm), a width of 23" (58cm) and a depth of 14.5" (37cm). This lovely Edwardian desk remains in very good solid condition. There is some wear and usage marks to the top surface including a few heavier marks where the finish has lifted. One of the inkwells is missing its lid. 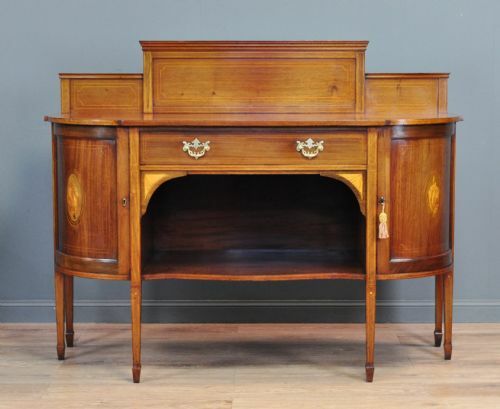 This remains a very stylish and elegant antique Edwardian Arts & Crafts desk. It will continue to provide good service for many years to come. Attractive antique walnut twin pedestal writing desk. A lovely walnut twin pedestal desk. We date this desk to the early 20th century. The desk sits on ornately turned legs with stretchers for support. The desk is fitted with a central kneehole drawer flanked by side drawers. The drawers are fitted with bun handles. The central drawer is fitted with a lock (key supplied). The right hand drawers are also fitted with locks, no key is supplied for these. The table surface has an ornately carved edge. The desk has a height of 30" (76cm), a width of 48" (122cm) and a depth of 28" (71cm). This lovely walnut twin pedestal desk remains in very good solid condition with surface markings commensurate with age and usage. There are some areas of wear to the top surface including a few small chips, marks and light scratches from past use. 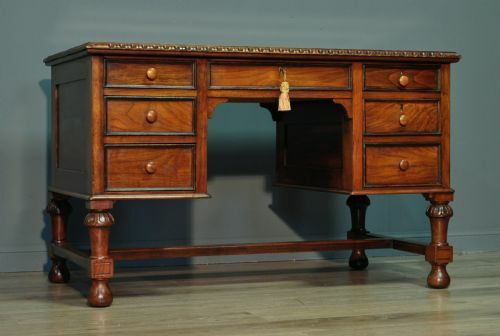 This remains a very stylish and elegant antique walnut twin pedestal desk. It will continue to provide sterling service for many years to come. 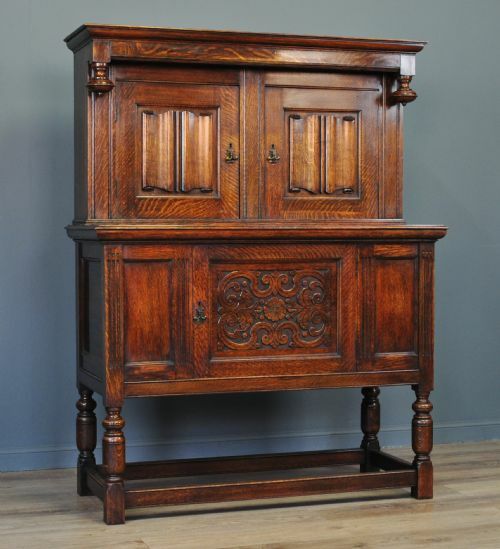 Attractive vintage solid carved oak sideboard cabinet. A lovely carved oak sideboard. We date this sideboard to the second half of the 20th century. The sideboard sits on cabriole legs with carved feet at the front. The main cabinet comprises of two side hinged door cupboards. The doors are fitted with locks (key supplied). There is a pair of drawers over the cupboard doors, the drawers are fitted with ornate drop handles mounted on pierced backplates. The sideboard has an overall height of 36" (92cm), a width of 43" (109cm) and a depth of 20" (51cm). This lovely vintage carved oak sideboard remains in a good solid condition with surface markings commensurate with age and usage. This remains a very stylish and elegant small vintage carved oak sideboard which will continue to provide sterling service for many years to come. Attractive large antique Edwardian inlaid mahogany sideboard. A lovely Edwardian mahogany sideboard. We date this sideboard to the early 20th century. The sideboard is supplied as a single section. The sideboard sits on six downward tapered legs with spade feet. The sideboard has a bow front design in the centre and comprises of a central kneehole drawer and shelf flanked by two cupboards. There is a large gallery to the rear of the table surface, this is removable to transport. The doors and drawer have attractive inlay, there are further shell inlays to the bow front doors. The drawer is fitted with brass drop handles mounted on shapely back plates. The cupboard doors have locks fitted (key supplied). The sideboard has an overall height of 47" (120cm), a main surface height of 36" (92cm), a width of 60" (153cm) and a depth of 23" (58cm) in the centre. 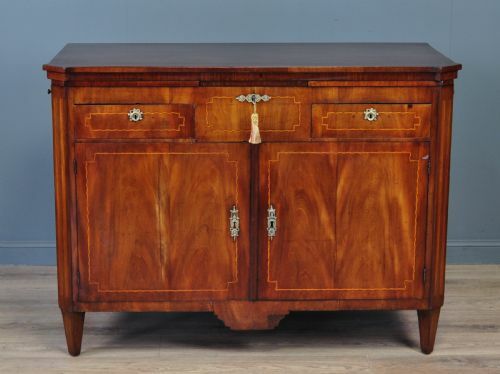 This attractive Edwardian mahogany sideboard remains in very good solid condition with only very minor surface markings commensurate with age and usage, including some minor marks, indentations and scratches to the surface finish. The finish has mellowed over time and one of the central legs has been repaired at some point in the past. There is a chip to the left hand side of the gallery top corner. 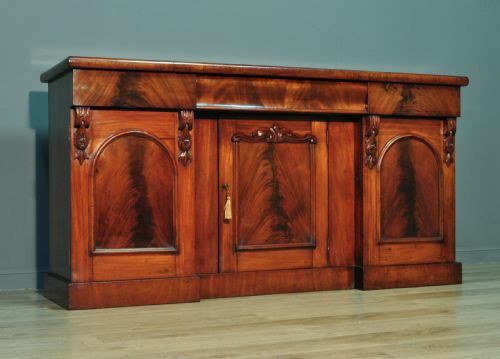 This remains a very stylish and elegant Edwardian mahogany sideboard. It will continue to provide sterling service for many years to come. Attractive antique Victorian mahogany pembroke table. A lovely Victorian mahogany pembroke table. We date this table to the late 19th century. The table sits on four slender turned legs. The legs sit above their original brass castors. The main oblong table top has two drop flaps along its longer edges. The drop flaps are supported on two brackets which swing out from the under table rail. One end of the table has a long deep drawer, the drawer is fitted with a turned wood bun handle. The table has a height of 29" (73cm), an un-extended width of 22" (56cm) and a length of 39.5" (100cm). With the drop flaps raised the width increases to 43" (109cm). 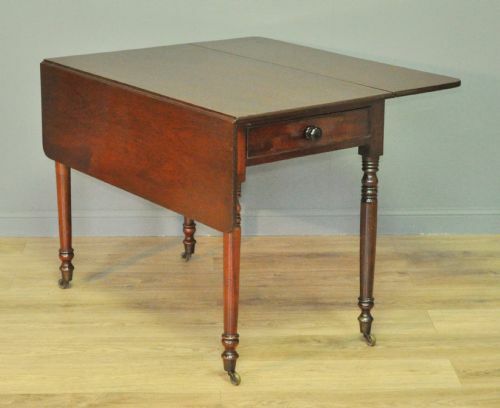 This lovely Victorian mahogany pembroke table remains in very good solid condition with only very minor surface markings commensurate with age and usage. There are a couple of very light usage marks, indentations and light scratches to the main table surface. 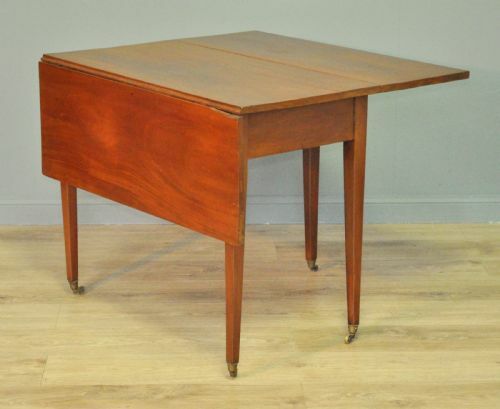 This remains a very stylish and elegant Victorian mahogany pembroke table which would function well as an occasional or dining table. It will continue to provide good service for many years to come. Attractive antique Edwardian inlaid mahogany splat back 48" bed frame. 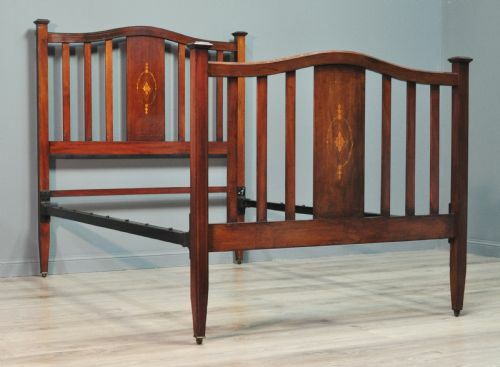 A lovely Edwardian mahogany bed frame. We date this bed to the very early 20th century. The bed comes in three sections, the head and foot boards and the metal side rails. The head board and foot board sit on square section legs above their small ball castors. The head and foot board legs are joined by two further large oblong section cross rails. The space between the top and middle cross rails houses slender oblong section spars either side of a large central oblong section inlaid splat. There is inlaid banding around the top and side rails of the bed and the central panels feature an oval inlay. The l-shape metal side rails slot into brackets on the head and foot board legs and provide support for a suitable base and mattress. The headboard has a height of 54.5" (139cm) and the footboard a height of 42" (107cm)both by 49" (125cm) wide. The side rails will support a suitable base and mattress 73" (185cm) long by 48" (122cm) wide. This lovely Edwardian mahogany bed remains in very good solid condition with only very minor surface markings commensurate with age and usage. There are a few minor marks , indentations and some light wear to the finish, primarily to some of the edges of the beds. The brackets for the rails have been replaced at some point in the past. This remains a very stylish and elegant Edwardian mahogany bed which will continue to provide sweet repose for many years to come. Attractive vintage pine chest of six drawers/bookcase. A lovely vintage chest of drawers. We date this chest of drawers to the late 20th century. The chest sits on a plain plinth base with a cut out to the front apron. The chest consists of six drawers over an open area with a top shelf. The drawers are fitted with button handles. The chest has a height of 57.5" (146cm), a width of 33" (84cm) and a depth of 15" (38cm). This attractive pine chest of drawers remains in good solid condition with only very minor surface markings commensurate with age and usage, including some minor indentations and wear to the finish. It looks as though there may have been shelves in the lower area but these have been removed at some point in the past. 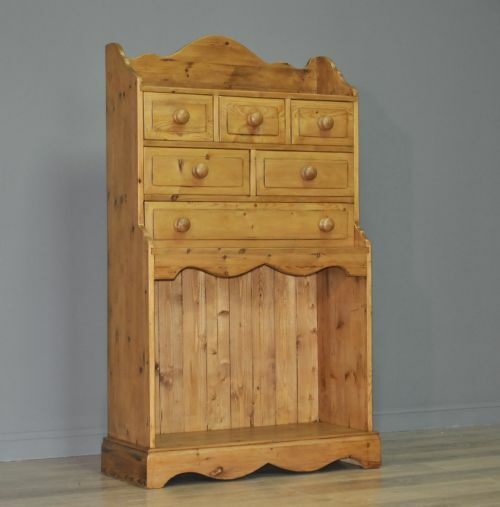 This remains a very stylish & rustic pine chest of drawers providing useful storage space. It will continue to provide good service for many years to come. Attractive antique Victorian mahogany drop flap dining table. A lovely Victorian mahogany dining table. We date this table to the late 19th century. The table sits on four slender downward tapered legs. The legs sit above brass castors. The main oblong table top has two drop flaps along its longer edges. The drop flaps are supported by one of the legs that swings out on each side. There is a further drawer to one side. The table has a height of 28" (71cm), an un-extended width of 19" (49cm) and a length of 36" (91cm). With the drop flaps raised the width increases to 43.5" (111cm). This lovely Victorian mahogany dining table remains in very good solid condition with only very minor surface markings commensurate with age and usage. There are a couple of very light usage marks, indentations and light scratches to the main table surface and there is a very slight age split to one end of the table surface. One leaf has a slight ring mark where something has been sat on it in the past and there is a small sliver of wood missing from the edge of a leaf as shown in the pictures. This remains a very stylish and elegant Victorian mahogany table which would function well as an occasional or dining table. It will continue to provide good service for many years to come. Attractive antique Victorian Arts & Crafts pitch pine bedside side cabinet. A lovely Victorian bedside cabinet. We date this cabinet to second half of the 19th century. The cabinet sits on four short shapely feet. The front of the cupboard has a panelled door. It is fitted with a stand out ceramic knob handle. There is a central mounted shelf internally and the top surface has a small gallery to the rear. The cabinet has an overall height of 30.5" (78cm), a main top surface height of 29" (74cm), a width of 15.5" (40cm) and a depth of 14" (35cm). This attractive Victorian pine cabinet remains in very good solid condition with only very minor surface markings commensurate with age and usage. There are some minor indentations to the top surface from past use and the handle is likely to have been replaced with a period one at some point in the past. This remains a very stylish & elegant Victorian pine cabinet. It could serve well as either a bedside cabinet or as a side cabinet. It will continue to provide sterling service for many years to come. Attractive antique Victorian cast iron bed. A lovely antique Victorian bed. We date this bed to the late 19th century. The bed comes in three sections: the head and foot boards and the interlocking rail frame. The head and foot boards sit on circular section legs above their original castors. The base slots in to the head and foot boards. There would have originally have been a sprung metal mesh within the frame but this has been removed at some point in the past. The head board has a height of 40" (102cm) and the foot board a height of 37" (94cm), both by 36" (92cm) wide. The bed will fit a mattress 75" (190cm) long by 36" (92cm) wide. 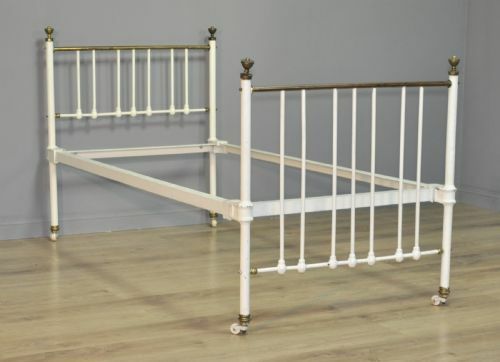 This lovely antique Victorian cast iron single bed remains in good solid condition with only very minor surface markings commensurate with age and usage. The bed has numerous marks and some indentations to the paint. The spars on the headboard have also been slightly bent. This remains a very stylish and elegant antique Victorian bed which will continue to provide sweet repose for many years to come.